Way back when, some guy decided to mash up his beans and add a little sugar and voila, another strange food idea was born that will never catch on in the Western world. Sweet bean paste can be found everywhere in Japan though. Originating in China, the most common place to find it is inside buns (see top pic, nice lighting eh?) 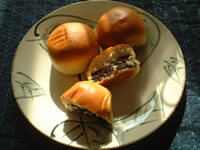 which are commonly called 'anpan'. 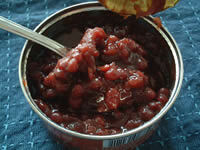 'An' means sweet bean jam, and 'pan' (taken from French 'pain') means bread in Japanese. You'll also find it in a bunch of other Japanese desserts such as on top of, or mixed with icecream, as well as eaten with rice. When you eat it for the first time it's hard to get over the fact that it's really just mashed up adzuki beans, which in my mind is a pretty big strike against it. With other things like chocolate and cake to choose from why would you want to eat sweet bean paste anyway? After a few times though you'll probably realize that hey, it's not so bad. Not only that, but it has all the benefits that any other bean has, including protein, high fiber, and gas. You've been warned.